The narrative of the Oshawa Generals game against the Kingston Frontenacs on Jan. 14 was much different than what appeared on the scoreboard. While the Gens emerged with a 3-0 victory, the majority of the game was a tight defensive battle with neither side giving an inch. After more than 40 minutes of scoreless hockey, with both teams having their share of scoring chances, Serron Noel took advantage of a mistake to give the Gens a lead they’d never relinquish. As the home team dumped the puck into the Kingston end, it took an odd bounce off the boards and left Frontenacs goaltender Jeremy Helvig, who had skated behind the neck to clear the puck, scrambling to recover. With a wide-open net, Noel took very little time burying his 17th goal of the season. Five minutes later, Renars Krastenbergs put Oshawa up by two, and later, Kenny Huether laid the final touches on the win with an empty-netter, his team-leading 19th goal, to the roar of the raucous 5,670 fans in attendance. Kyle Keyser was perfect in net for the Gens, stopping all 34 shots he faced to pick up his second shutout of the year, and second of his OHL career. Assistant coach Greg Nemisz believed it was one of the team’s best whistle-to-whistle efforts of the 2017/18 season so far. “From the beginning, we were competing down to every man-on-man situation,” Nemisz said. Even though they won by three goals, Nemisz acknowledged the Gens had to grind out the victory. “It’s a special win over a tough team,” he noted, adding it was a much improved effort from a 4-1 road loss to Kingston the previous evening. The Frontenacs had their way with the Gens, outshooting them 41-20, with Oshawa managing only one shot in the entire third period. 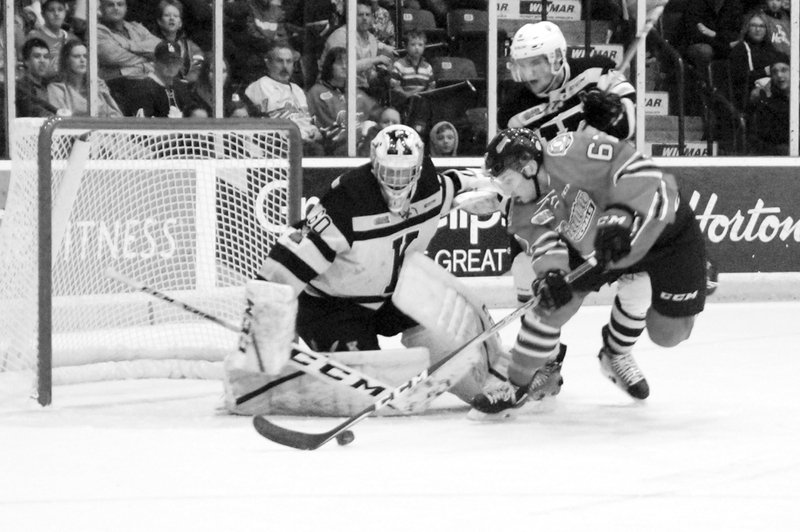 The weekend was a busy one for the Oshawa defense, as the team was outshot 46-24 on Jan. 12 against the Flint Firebirds, but still managed to walk away with a 5-3 victory. Keyser was standing on his head the entire game, facing 24 shots in the second period alone, and 40 in the last two periods combined. The win featured a balanced offense, with goals from Krastenbergs, Huether, Hayden McCool, Eric Henderson and William Ennis. Matt Brassard and captain Jack Studnicka both added two assists each. The win puts the Generals 7-2-1 in their past 10 games, currently sitting fifth in the OHL’s Eastern Conference, three points behind Kingston. The team is next in action on Jan. 20 against the Peterborough Petes and returns to the Tribute Communities Centre Sunday against the Sarnia Sting on Jan. 21.